like just about every woman who was born with curls, I was repressing a sigh as I saw some of the Oscar looks. Gwyneth, Reese and Nicole were all rocking my dream hair: Stick-straight and very blonde. However, Barbie isn't the only trend this season. 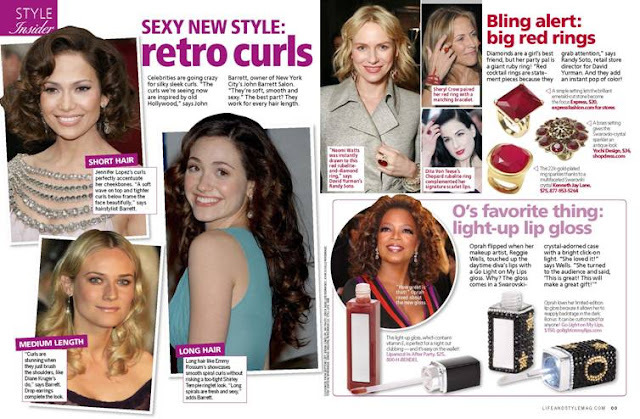 According to the latest Life & Style issue, big curls are also an option, and a very cute one. We saw it on J-Lo at the Oscars, but I wasn't very fond of that. There was something creepy in her look (and I don't mean her husband). I guess that i just don't buy the retro look on Jenny from the block. I really like the version you can see on Emmy Rossum. It's pretty, looks effortless (though I'm sure that it actually took some work) and very fresh.